Hey everyone! Obviously you've come to this post because you know that there is some sort of giveaway happening over here on mollievictoriabeauty and you might be wanting to enter. Before we get to all that nonsense where I politely ask you to follow me on all my social media accounts for some entries, I just want to say a little bit about why this giveaway is happening. Basically this giveaway is to celebrate me hitting two milestones on my social media accounts. I hit 500 on Twitter and 600 on Instagram on the same day and I couldn't be more proud of myself. After these little milestones, I finally set up my Facebook page and I'm excited to see if I can hit some on there too. So without further ado, lets get to the giveaway! I've decided to give away a Mac lipstick (of the winners choice) to one lucky person who enters the Rafflecopter below. The giveaway will run from today (13th of Jan) to the 13th of Feb - so you have a whole month to enter! So if you want to enter, just use the Rafflecopter widget below and if you have any questions, feel free to contact me either through the comments, on Twitter or via my email at molmcneice@gmail.com. Well done on hitting your milestones! 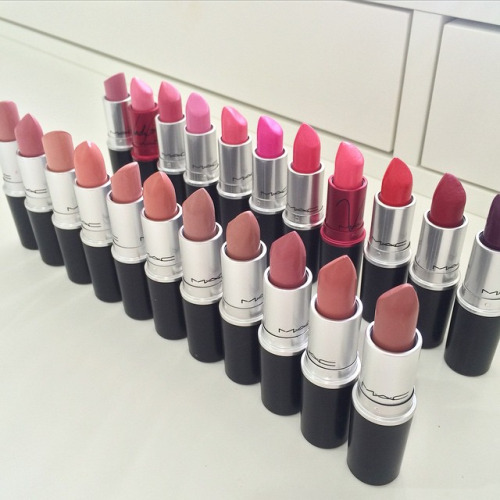 I did a MAC lipstick giveaway before and they always seem to be super popular so brilliant choice. Congratulations on your big achievements. Can't wait to check who won! I think this is the best giveaway that I've seen! Thank you for the lovely giveaway & Conratulations on all of your wonderful achievements! Its my pleasure and thank you very much! Congratulations on this!! Great Milestone! !